The dough stores great in the fridge to bake as needed or you can preheat your oven to 400 deg F if you’re baking them today. Combine flours, oats, baking powder, and sugar. Add in cold butter and mix until butter is pea-sized. Mix milk, syrup and eggs, then add to the flour/butter mixture. Mix until just combined, it will be sticky. Roll out to about 1” thick. You’ll see bits of butter in the dough – it’s going to be so good! Cut into rounds and put on a baking sheet lined with parchment paper. At this point, you can either refrigerate for a few days and bake as needed or you can brush the tops with egg wash then pop in the oven and bake until tops are crisp – about 20 minutes depending on the size and your oven. 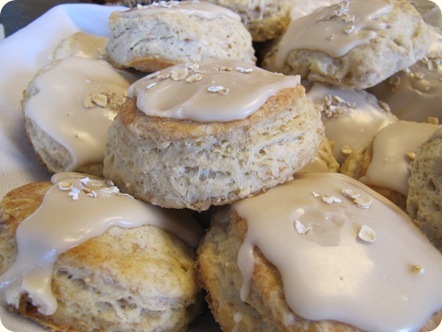 Make the glaze and drizzle cooled (5-10 min) scones with the glaze and a sprinkle of oats for a garnish. We had friends visit last month and these were a huge hit at the brunch we hosted. What fun to put on a brunch. Cranberry harvest muffins, banana bread, orange pound cake, scones, fritatta, juice, home smoked pork loin, shaped butters…I’ll share more recipes from our brunch. Keep your eyes open. These scones are so delish for breakfast, brunch or any time! This post is under “Recipe Box” and has 4 comments so far. Oh, my gosh! those look amazing.